← You can make Merriweather better. When I proposed the design of Merriweather to Google it was with the goal of creating a workhorse text typeface for the web. I wanted to make something as legible and pleasant to read as possible which meant adapting the design to screens and to as many web browsers and operating sytems as possible. I will write more about how the adaption is done in a later post. At the same time I was also keen to add something genuinely new to the styles we read everyday on screens. Text faces may look alike but the subtle differences in feeling are important to me. Considering that we are doing more and more reading on screens rather than paper I chose to do this by returning to a style that isn’t commonly available. I decided to evoke the familiar feeling of old book type. One of the features I use to give this flavour is diagonal stress. Note: Most ( but not all) type designed for screens uses a vertical stress. Managing diagonal stress is more complicated and time consuming than vertical stress in a type design. However diagonal stress is part of what makes old fashioned book type feel the way it does. Saying “book type” is a bit imprecise. Merriweather’s sources of inspiration are more specific than that. To begin with Merriweather tries when possible to keep the feeling found in 16th century French types such as Garamonds and Jannons and Elzevir types as well as Aldine 15th century Italian type. Mixed into this is the need the type work at small sizes on screen which required the adoption of some the structural features of more modern and specifically screen type. Merriweather is therefore inspired by the methods used by much more contemporary designer including the types of Gerrard Unger, Steve Matteson, Paul Barnes & Christian Schwartz, Joshua Darden and Christoph Noordzij. These designers’ work showcases the process of simplifing, regularizing, and essentializing letter shapes in order to better perform a specific task. If you look at Merriweather one of the features that is likely to be most obvious is an very large x height. Merriweather’s x height is so large that when it is laser printed it looks almost comical to me. I don’t consider this a problem because Merriweather is not a hybrid design meant to perform equally well in both print and screen. Instead it is a font design for screen first and a print font as quite a distant second. I should note that it will be perfectly possible to make a seprate print version if anyone wants one later on. Merriweather uses purely vertical stems vs ones with entasis. This image shows the Capital letter “I” in Carol Twombly’s Trajan and Merriweather’s I. Notice how the stem bends gently inwards in Trajan. Merriweather uses a simpler shape which makes it cleaner looking at small sizes. Merriweather also uses horizontal compression so it may look a little squeezed. 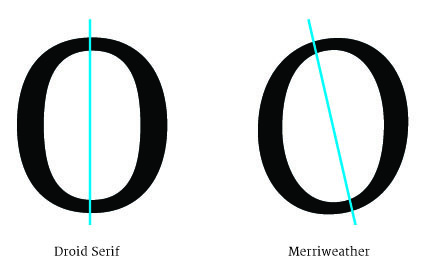 This example shows the lowercase letter “o” from Minon Pro and Merriweather. Merriweather also uses low variation of letter widths, low contrast and heavy simple shapes for serifs and terminals. This sample compares Monotype Baskerville with Merriweather. Merriweather is an open source project. Because of this making sure extending the design or collaboration would be less difficult in the future if possible was definitely part of the point of the project. This is part of the reason for using relatively simple shapes in serifs, terminals and stems. This entry was posted in Font, Serif, Type, Typography. Bookmark the permalink. I did my best to arrange them in order from least to greatest x-height, but the Merriweather family actually seems to be in the middle of the pack. That’s not to denigrate it in any way, though; it’s still highly readable and enjoyable, and the difference only seems to be by a few pixels. I don’t find it, or any of the other fonts I compared, “comical” in print at all. The new Merriweather serif will have a lower x height (like the sans) because that lets it render better with TTFA auto hinting. It also makes it more versatile in print. Whoops! Forgot to make the text paths; if you don’t have all those fonts installed it won’t show up properly. Here’s a fixed version of the comparison: http://imgh.us/X-height_1.svg. I’ve been a long fans of Georgia. But last year I want something different and ended up using Merriweather. Such a georgeous font! Have been fumbling for a font for a while, finally settled on Merriweather Sans & Serif. Are you saying it’s now print-grade? If not, what’s the closest print-grade font to Merriweather Serif?